If you’re looking for a sidebar menu with a healthy dose of sophistication, the Dropdown Sidebar Menu Responsive Bootstrap Navigation plugin could be just the thing you need. 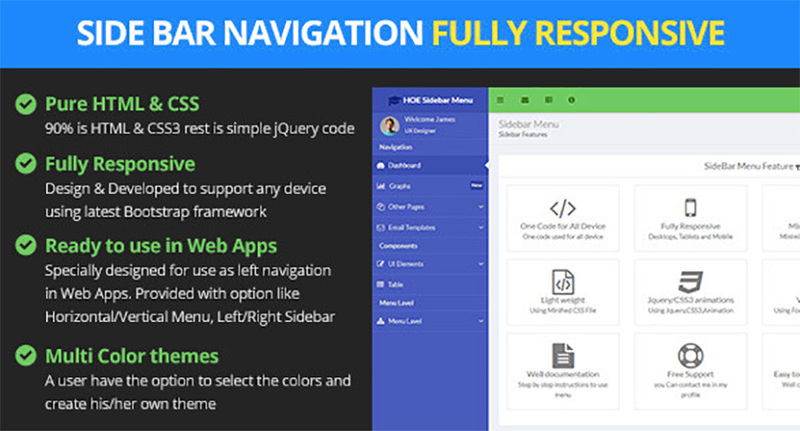 The plugin supports multiple navigation styles, and users can set the default or change any navigation affecting window load and sidebar toggle features. The TinyMCE Bootstrap Plugin is a Bootstrap toolbar for TinyMCE that allows you to extend TinyMCE functionality using any Bootstrap element, like buttons, icons, labels, pagination, etc. Looking for a plugin to display your images beautifully? 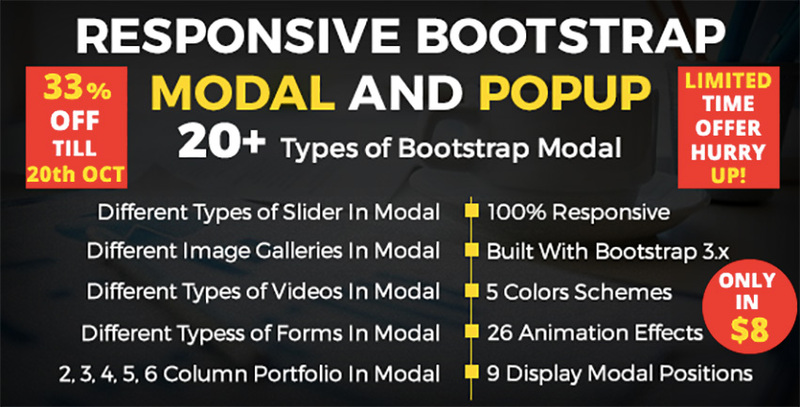 If so the Responsive Bootstrap Modal and Popup plugin will probably do the trick. The plugin features modals and popups with a pleasing variety of elements like an image gallery, sign-in, and subscribe and contact forms, as well as 20 stunning ready-to-use examples of various modals. Flexible and highly customisable, the Flat - Responsive Bootstrap Menu plugin is a great choice for building your custom Bootstrap responsive menus. 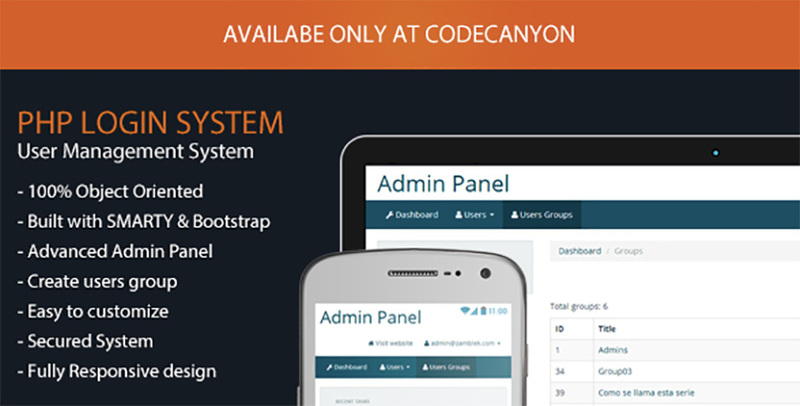 The plugin offers horizontal and sticky menu versions and five different colour schemes. 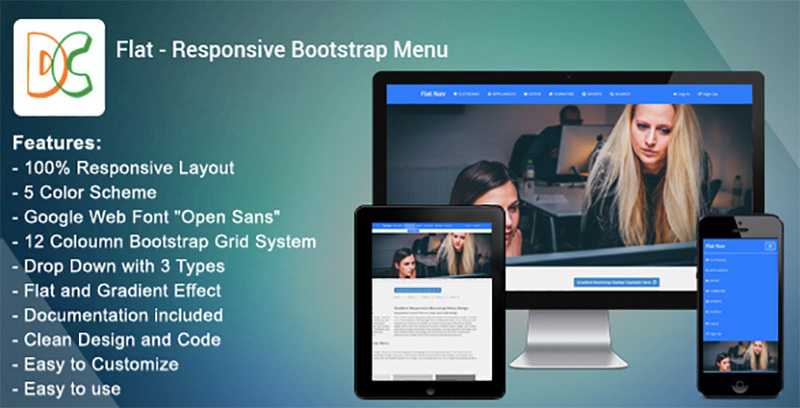 Flat - Responsive Bootstrap Menu is highly versatile and suitable for any type of website, template, or landing page. The Paradise Slider plugin features a selection of beautiful sliders in a variety of styles like sliders with thumbnail navigation, multiple image sliders, full-screen slider, carousel video background and parallax slider, etc. With 12 layouts and effects and tons of customisable options, Flip Box is easy to integrate into any website. The Zlogin - Simple Login System with Bootstrap plugin provides users with a simple, secured and easy-to-customise login and user management system that will integrate with your own website beautifully. Zlogin - Simple Login System with Bootstrap can also be used as a start point to build your own CMS with a private user area where visitors to your website have to be logged in to view page content. 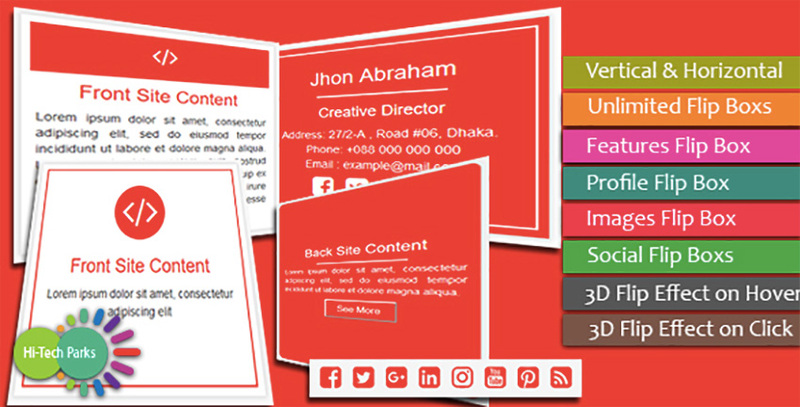 Responsive Bootstrap Sidebar Navigation is ideal for those looking to add a bit more functionality to their sidebar. 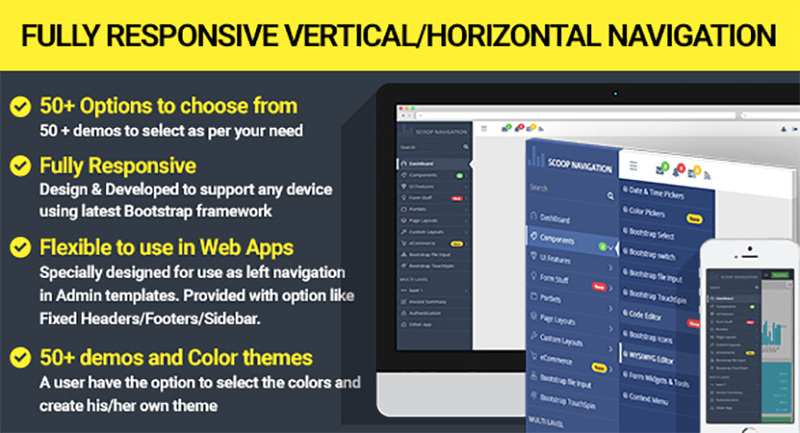 The plugin adds both horizontal and vertical navigation menus with four levels of submenus to your sidebar. Need to test different styles on your website? Try DMSS - Bootstrap jQuery Style Switcher for an easy way to see Drupal or WordPress Themes and HTML5 website or Joomla templates in as many styles as you want. DMSS - Bootstrap jQuery Style Switcher is easy to set up and use and a great way to create unlimited styles. 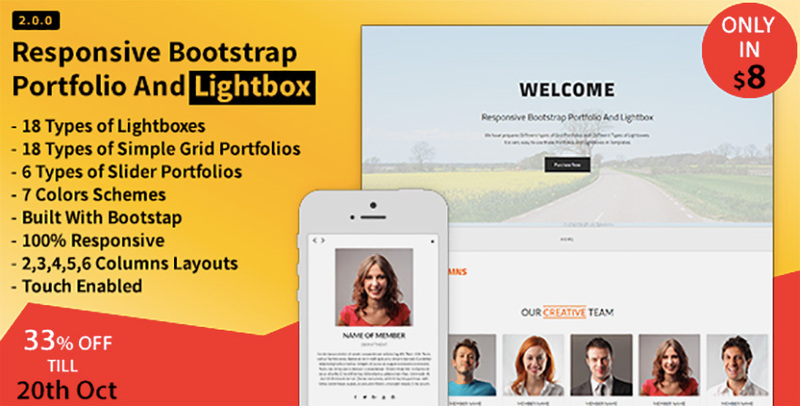 The Responsive Bootstrap Portfolio and Lightbox plugin allows you to show off your images to their best effect. The package contains different types of lightboxes and portfolios such as image and video galleries, carousels and sliders of different types, etc. and allows users to create two, three, four, five, or six column galleries easily. These plugins just scratch the surface of products available at Envato Market. So if none of them catch your fancy, there are plenty of other great options there to hold your interest.